When thirteen-year-old Ronan Truelove’s seemingly ordinary mom snatches him from school, then sets off on a high speed car chase, Ronan is shocked. His quiet, nerdy dad has been kidnapped? And the kidnappers are after him, too? His mom, he quickly learns, is anything but ordinary. 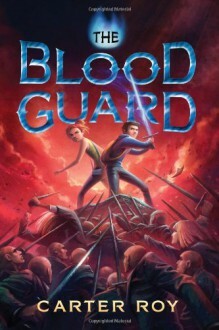 In fact, she’s a member of an ancient order of knights, the Blood Guard, a sword-wielding secret society sworn to protect the Pure—thirty-six noble souls whose safety is crucial if the world as we know it is to survive. Now all those after-school activities—gymnastics, judo, survival training—she made him take, make sense. For suddenly Ronan is swept up in a sometimes funny, sometimes scary, but always thrilling adventure—dashing from one danger to the next, using his wits to escape the Bend Sinister, a posse of evil doers with strange powers. Falling in with two unlikely companions, Greta, a scrappy, strong-willed girl he’s never much liked and Jack, a devil-may-care teenage pickpocket, Ronan is left with only his wits and his mom’s last words of advice: Trust no one. That’s a lot for an ordinary kid to deal with. But then again, maybe Ronan’s not ordinary at all. http://San.booklikes.com Reviews in Chalk 4.0 The Bood Guard.